"This book is the secret sauce..."
"Running Down a Dream is a book about how to do the thing most people want to do but tell themselves is too scary, too hard, too unlikely." "Shatters the mold of typical self-help." "The truth about how to succeed." When you dream, you envision a magical future...the day when you have heroically slain your dragons and unlocked the creativity and genius buried deep inside. But how do you actually get to that destination? You can analyze the myths of visionary creators-artists, writers, musicians, software developers, etc. who have accomplished the impossible. You'll read about how they went for it, refused to quit, and would not be denied. But exactly how these successful creators went from being fearful dreamers to accomplished artists proves elusive. 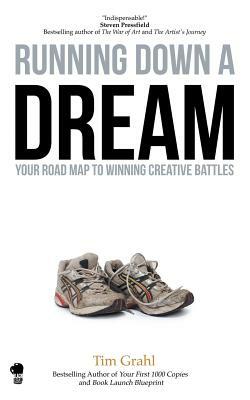 Running Down a Dream unflinchingly bares the naked truth of creation and shares the practical to-do list to take you from here to there. You don't have to be an Austen or a Michelangelo or an Oprah to create a work of art. There is no glossing over the pain, embarrassment, and financial terror necessary to contend with on your journey to mission accomplished. What lies ahead for you is the realization of your heroic self. The run is worth it in ways you can't yet imagine. Tim Grahl works with bestselling authors such as Daniel Pink, Chip and Dan Heath, Hugh Howey, Dan Ariely and Pamela Slim. He recently had five clients on The New York Times best seller list at the same time. Tim is also the moderator and guinea pig for The Story Grid Podcast, a weekly conversation with editor Shawn Coyne exploring just what it takes to craft a compelling story. His first novel, The Threshing, is the result of the work he and Coyne have done on the show and is due to publish in 2019. Tim's bestselling books, Your First 1000 Copies: The Step-by-Step Guide to Marketing Your Book and Book Launch Blueprint: The Step-by-Step Guild to a Bestselling Launch are the definitive guides on how authors can build their online platforms.